1. Cook the rice in boiling water for 10–12 minutes until tender then drain. 2. Meanwhile, heat ½ the oil in a large frying pan and add the eggs, cook for 1 minute, stirring until scrambled, remove and set aside. Add the remaining oil and fry the onions and pepper for 3–4 minutes. 3. 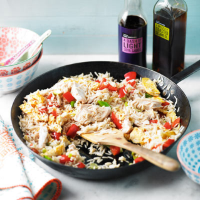 Add the chicken, eggs, rice and soy sauce and cook for 2–3 minutes to heat through. Serve immediately.